When Utah State athletics director John Hartwell met Sunday with Tim Duryea, the Aggies basketball coach asked if another win or two in the conference tournament might have been enough to save his job. The answer? No. The decision to fire him after three seasons as the coach in Logan was about much more than that. “It was not over one game,” Hartwell said. Utah State prides itself on its tradition of basketball success. 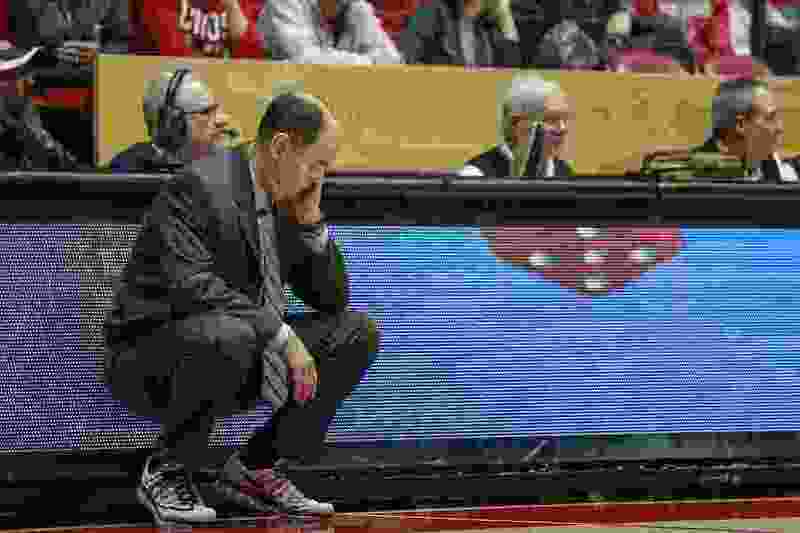 As Hartwell assessed his men’s basketball program, however, he no longer saw the enthusiasm that once filled the Dee Glen Smith Spectrum, and he no longer envisioned a path back there with Duryea at the helm. In an interview with The Salt Lake Tribune this week, Hartwell said wins and losses were a factor in the decision to fire Duryea, but there also were concerns about the future of the basketball program, an alarming drop in season ticket holders over the past four years and what Hartwell called “fan apathy” in Logan. Hartwell praised Duryea’s character during his tenure as USU’s coach. The Aggies went 47-49 in his three seasons as their bench boss. And their run to the Mountain West semifinal game this month was actually their best finish since joining the conference five years ago. But attendance in Logan plummeted during Duryea’s time as coach. The Aggies averaged 9,829 fans per home game in 2014 and just 6,872 per game in 2017, according to the NCAA. Hartwell said season ticket sales declined by 35 percent in that same time. That was enough for Hartwell to part ways with Duryea, despite the coach having another year (about $379,000 in salary the university will have to pay out) left on his contract — not an insignificant chunk of USU’s roughly $35 million athletics budget. “We’ve looked at our revenue streams and looked at some opportunities to be able to fund that, and we feel comfortable with being able to fund that,” Hartwell said. USU’s most successful times came under longtime coach Stew Morrill, for whom Duryea worked for 14 years. That success, however, also came while playing in weaker conferences. Hartwell nevertheless said he expects the Aggies to be among the “upper echelon” of teams in the Mountain West, regularly finishing in the top third of the 11-team league. “I believe from a facilities standpoint, from our practice facility and the Spectrum, and looking at the tradition of our program, it’s a realistic expectation,” Hartwell said. Duryea’s firing comes about a month before the April signing day for basketball recruits. To help with the transition, the Aggies have placed assistant coach Spencer Nelson, himself a former standout at the university, at the head of the basketball program for now. Nelson and the rest of the Aggies assistants will remain on staff at least until a new hire is made. Hartwell said he hopes to have a new coach in place about the time the Final Four of the NCAA tournament begins. Hartwell said has been contacted by “current Division I coaches, guys that have collegiate experience and are in the NBA now and collegiate assistant coaches” regarding the job. Hartwell said he did not believe previous collegiate head coaching experience necessarily would be a requirement for the job. The AD also said he is not necessarily looking only for a coach from Utah or someone with Utah ties, though an understanding of “the blueprint for success” in the state would be essential.